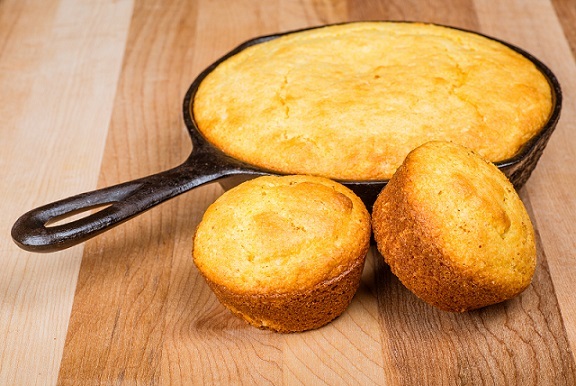 This traditional Cornbread Recipe takes me back to my childhood days with my mother making cornbread and traditional chili or soup. The aromas were wonderful and the meal was just soooo gooood! But thanks to mother, and probably her mother before her, I am able to enjoy the same experience today, at home and at the restaurant. Both this restaurant recipe for traditional cornbread and the traditional chili and soup recipes have passed the ultimate test. Restaurant customers have paid to have these items for over 30 years. It is a comfort food that helped build a restaurant business. Preparation time: 15 minutes. Servings: 16. Serve this delicious cornbread with traditional chili, Garden Patch Soup, Country Ham Soup or Green Chile Beef Stew or my secret Three Bean Enchilada Chili. Great "combos!" 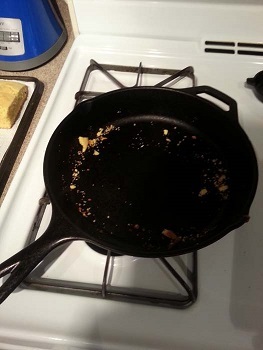 Always have your oven preheated to the correct temperature or your cornbread may not bake correctly. Check doneness at the earliest suggested time as ovens vary in temperature. 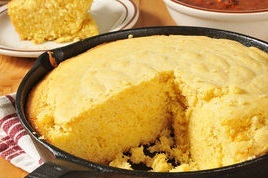 I use a cast iron pre-seasoned cornbread pan when making this recipe. I give it 5 Stars! I love it! 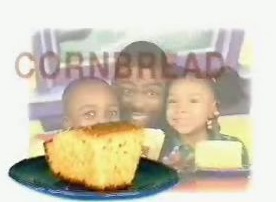 ENJOY your cornbread and the company of those you share it with!